I love world cultures! My curiosity over years has made me spend a lot of my time conducting self-studies on various cultures, their rituals, customs, and of course, jewelry. 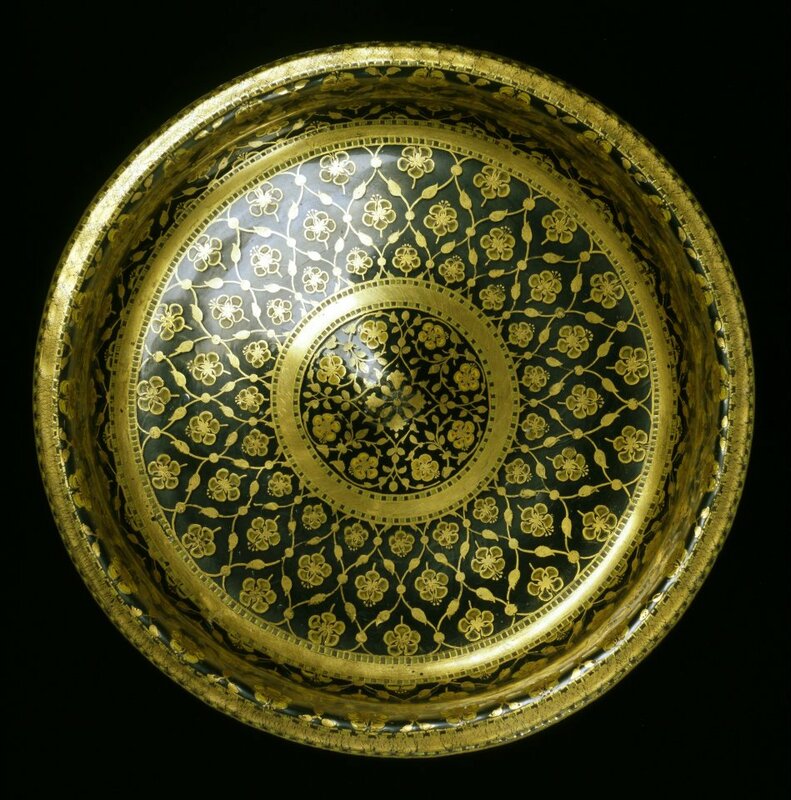 I hope you enjoy my curated list of Mughal jewelry and artifacts in this blog post! Mughal emperors were lovers of precious stones, numerous references show the strong cultural belief in gemstone properties. The Timurids, ancestors of the Mughals, had begun the tradition of engraving titles and names on stones of outstanding quality and, along with diamonds and emeralds, large spinel beads were their favorite. As much as these gems were a symbol of the opulence and dignity of the empire, they were also treasured as protective talismans. Emeralds were enormously popular with the Mughal Court, whose emperors referred to them as “Tears of the Moon” because of their opaque transparency. 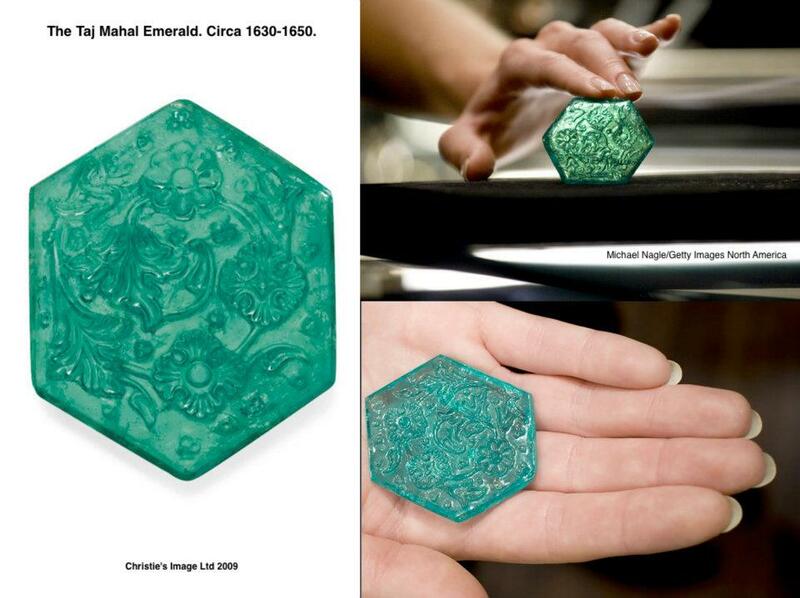 One of the most treasured jewel in Indian history: The Taj Mahal Emerald. Circa 1630-1650. 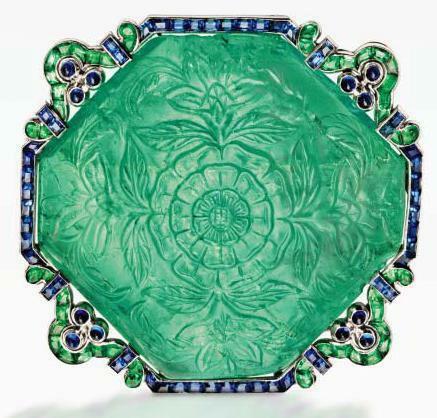 A hexagonal-cut emerald, weighing approximately 141.13 carats, it is carved with stylized chrysanthemum, lotus and Mughal poppy flowers, within asymmetrical foliage, to the plain reverse and beveled border. This intricately carved stone is one of a small group of exquisite emeralds commissioned by the Mughal Court, possibly during the reign of Emperor Shah Jahan. The name of the emerald is derived from its intricately carved surface of lotus, poppy flowers, and other foliage that mirrors the decoration of the Taj Mahal. At the Paris Exhibition of 1925, 'The Taj Mahal Emerald' was one of three large Mughal emeralds that featured prominently in Cartier’s Collier Bérénice, a spectacular shoulder ornament that also boasted pearls, diamonds, and black enamel. The rulers of Mughal India often ordered their names and titles to be inscribed on rubies, emeralds and diamonds, a practice which originated in Iran under the Timurids (1370-1507). Some of these gems ended up in the collection of the Mughal emperors who continued the tradition. In some cases, as the gems were passed down further names were added below those of the previous owners. Many were repolished, recut and re-set as they were handed down. The inscriptions were executed using the traditional cutting wheel or diamond-tipped stylus. The rectangular-cut emerald known as 'The Mogul Mughal' weighing 217.80 carats. It's a magnificent emerald with a great back story! Carved emerald with a Shi`ite invocation; Mughal or Deccani, 1695-1696. The reverse carved all over with foliate decoration, the central rosette flanked by single large poppy flowers, with a line of three smaller poppy flowers either side, the bevelled edges carved with cross pattern incisions and herringbone decoration, each of the four sides drilled for attachments, 2 1/16 x 1 9/16 x 7/16 in. (5.2 x 4x 1.2 cm.) Originally mined in Colombia, it was sold in India, where emeralds were much desired by the rulers of the Mughal Empire. This carved flat emerald is set in a platinum, gold, and diamond pendant necklace. The emerald was discovered in Colombia, possibly by Spanish conquistadors, and found its way to India for cutting. Smithsonian, photography by Ken Larsen. 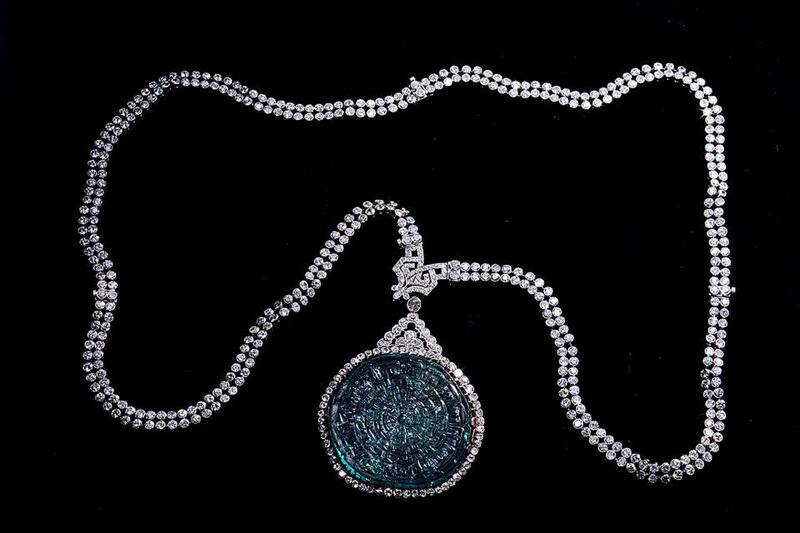 Historic and remarkable Mughal Emerald necklace. Small drill holes in the sides of the emerald, possibly used to attach the stone to a cloak or turban, also are consistent with a Mogul origin. The emerald is surrounded by round diamonds and is suspended from a double row diamond necklace; the diamonds total approximately 50 carats. 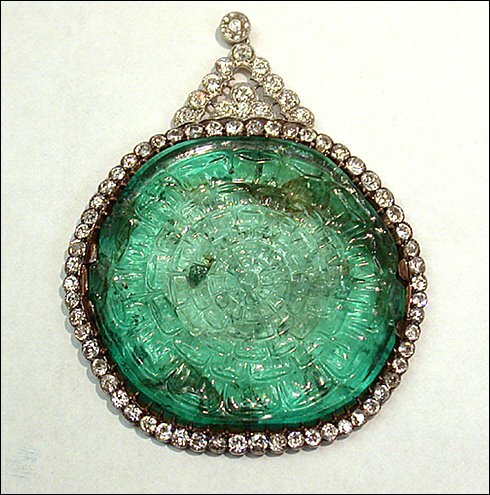 A hallmark indicates that the Mogul emerald was set into the pendant and necklace in France around the turn of the 20th century. Smithsonian, photography by Ken Larsen. Marjorie Merriweather Post’s platinum brooch from the 1920s, featuring a spectacular 60-ct. carved Mughal emerald surrounded by diamonds. Spinels (balas rubies) were highly prized in the Mughal court and were usually drilled as beads and used as pendant gemstones on necklaces, turban ornaments or earrings. Abu'l Fazl treasury historic records indicate a hierarchy of gems where spinels were listed in advance of diamonds, rubies, sapphires and emeralds. They were admired for their colour which followed the Persian literary tradition of representing wine and the sun, evoking the light of dusk. Tavernier reported that he counted 108 large balas rubies (spinels, it is believed) mounted on the famous Peacock Throne, all cabochon cut, the smallest weighing about 100 carats and some 200 carats or more. An Imperial Mughal spinel necklace with eleven polished baroque spinels for a total weight of 1,131.59 carats. Three of the spinels are engraved. Two with the name of Emperor Jahangir (1569-1627), one with the three names of Emperor Jahangir, Emperor Shah Jahan and Emperor Alamgir, also known as Aurangzeb. Inscribed royal spinel (balas ruby) weighing 249.3 carats. This majestic stone is inscribed with the names of its six imperial owners and has the distinction of having the second-most number of such inscriptions. 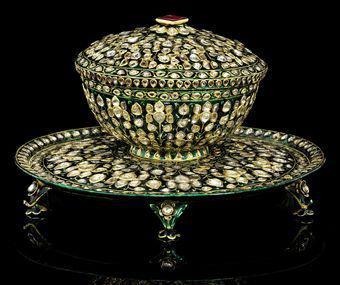 It was a gift from the Safavid Shah Abbas the Great of Iran to the Mughal emperor Jahangir in 1621. Image courtesy of © The Al-Sabah Collection. 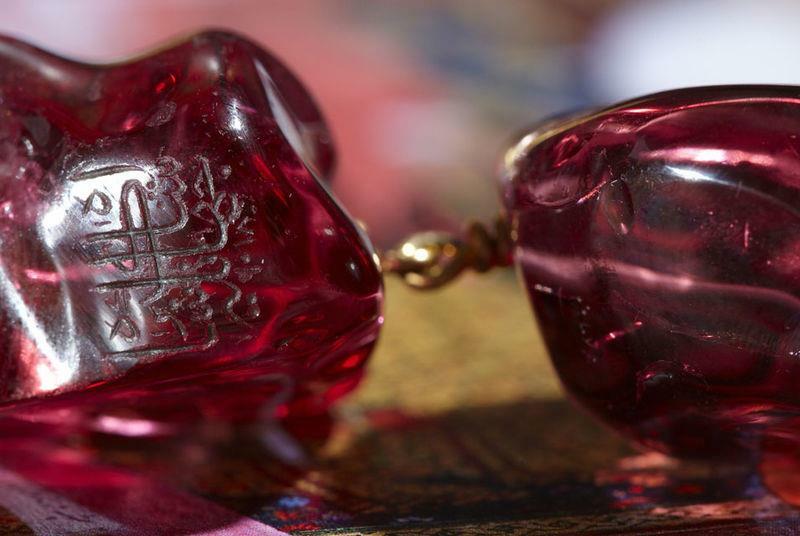 Detail: Inscription on an Imperial Mughal spinel necklace. These spinels mainly originated from the Badakhshan mine, in the 'Pamir' region (on the frontier between Afghanistan and Tajikistan). This province gave its derived name to spinels, described as 'Balas rubies' for decades. The Taj Mahal Diamond [circa 1621] - a diamond with extraordinary provenance! Owned by Jahangir, ruler of Mughal India and father of Shah Jahan who built the Taj Mahal. 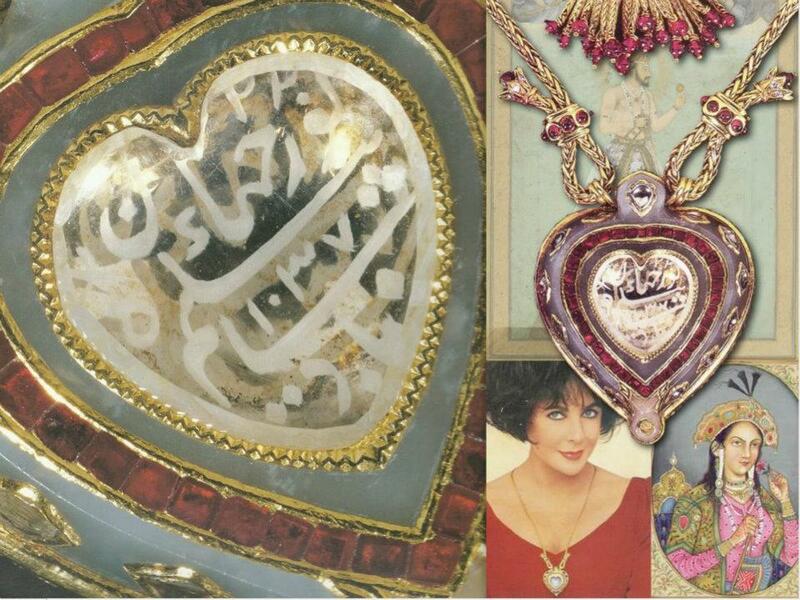 The Taj Mahal diamond was gifted by Richard Burton to Elizabeth Taylor for her 40th birthday. Diamond is inscribed in Arabic on either side. Legendary Taj Mahal Diamond. I was fortunate to privately view and hold this diamond in the palm of my hand at Christie's New York in December 2011. It's an incredibly piece of diamond history. The powder flask was an essential firearm accessory and held the fine powder needed to make the gun fire. Gunmakers in India during the Mughal era (1526-1858) specialized in carving ivory powder flasks with animal figures. Often, as this example, the decoration consists of intertwined and composite creatures that seem to grow out of or attack one another. 18th century. 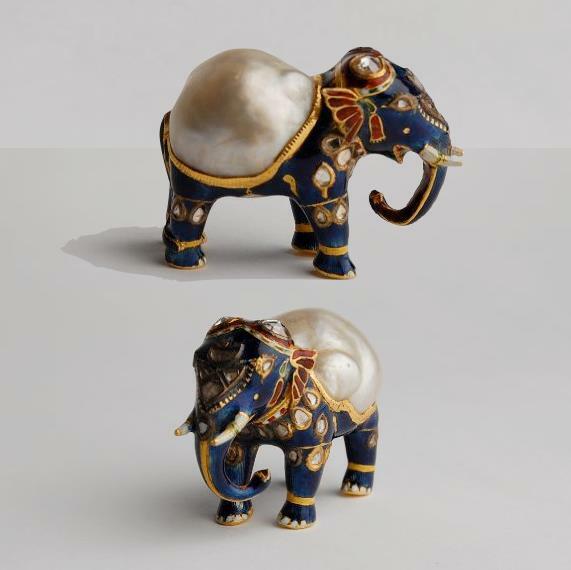 Note: International trade in ivory is banned (The Convention on International Trade in Endangered Species (CITES). 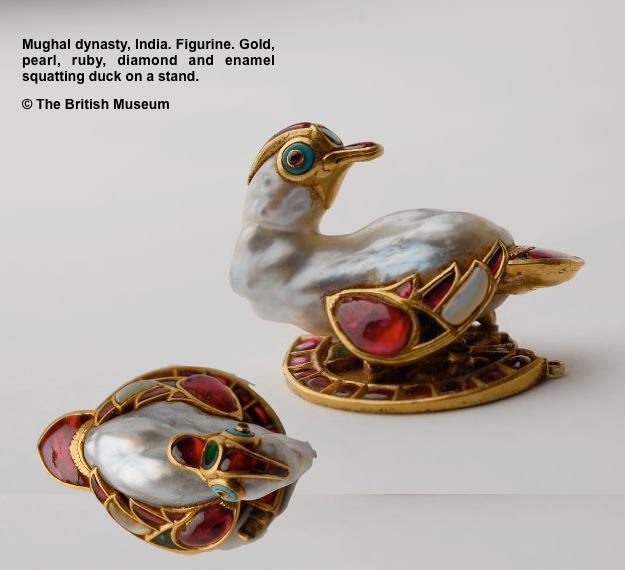 An unusual ivory Archer's Ring in the form of a Falcon probably Mughal, 18th Century formed by a three dimensional bird with ruby-set eyes and folded wings. Photo: Bonhams. 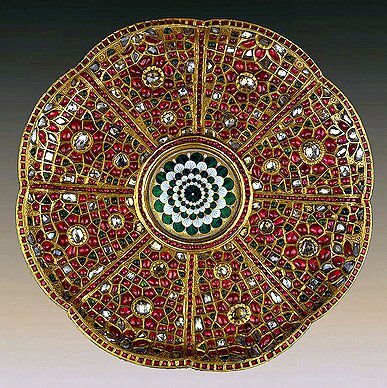 Dress archery ring of Mughal emperor, Shah Jahan. Second quarter of the 17th century. Gold set with carved and polished uncut diamonds, rubies and emeralds. Photo: State Hermitage Museum. Mango-Shaped Flask, mid-17th century India Rock crystal, gold and gemstone inlay. Photo: The Metropolitan Museum of Art. Carved emerald circular box. Mughal India circa 1635. An identical cypress is carved on each panel. 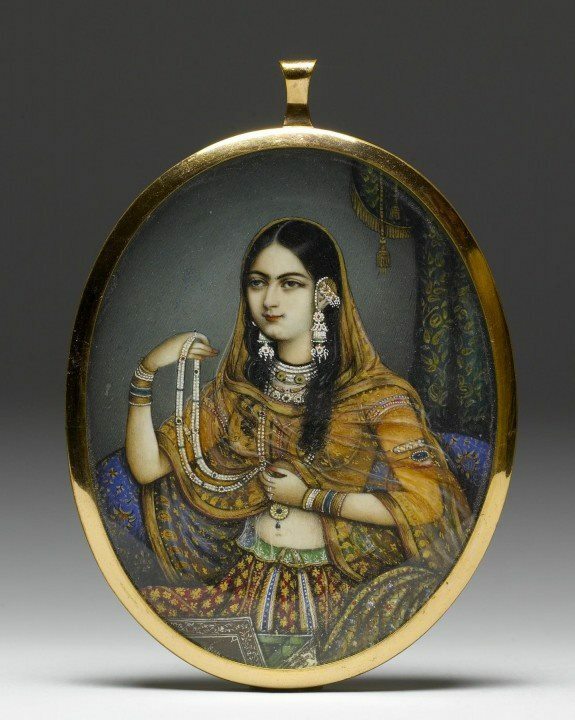 Similar boxes made of various precious materials appear in Indian miniatures from the early 17th century on. They could have been for medicines (including opium, a Mughal panacea) or to hold even more precious objects, such as uncut diamonds. 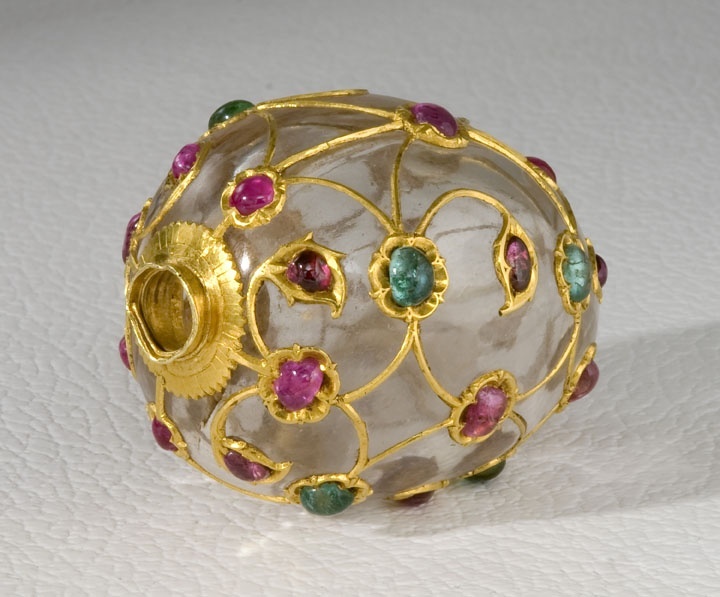 A Mughal-style gemstone-encrusted white jade scent bottle. 18th/19th century. 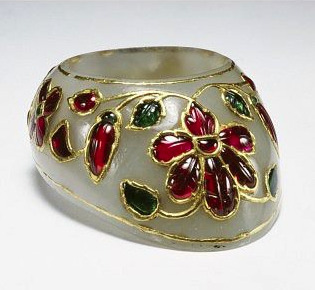 Of flattened circular shape on a short oval foot, the cylindrical neck fitted with a screw-top cover with a knop finial, the body inlaid in gold and inset with gem stones including diamonds, rubies, sapphires and emeralds, depicting two panels on the front and back enclosing birds and blossoming branches, the sides with further blossoms. Highly detailed plate. 17th century, Mughal India. Gold, kundan setting technique, uncut diamonds, rubies, emeralds and enamel. 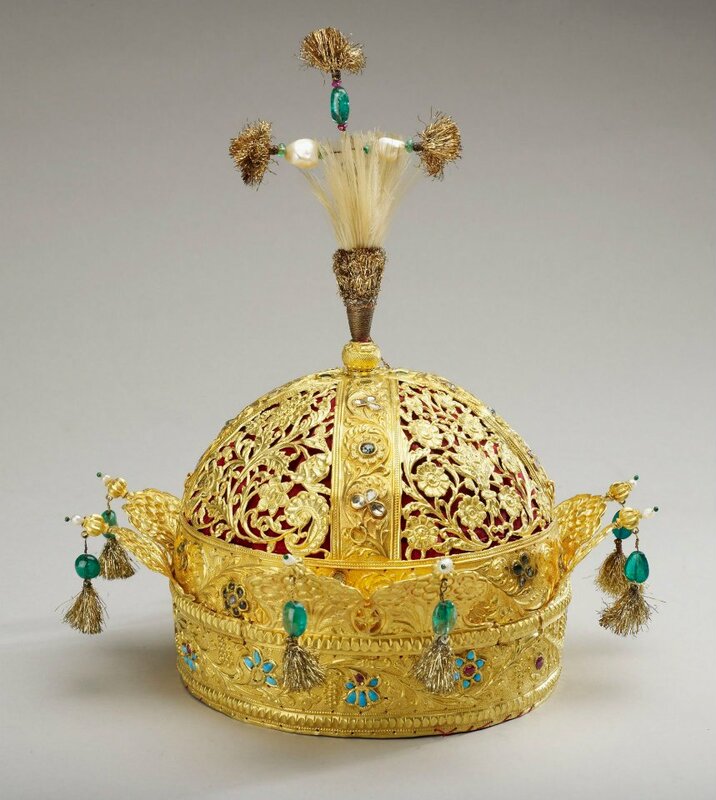 Presented by the ambassadorial mission of Iranian ruler Nadir-Shah to the Russian Imperial Court, 1741. Photo: State Hermitage Museum. Kundan set eagle pendant. Mughal, India. Rubies, diamonds, pearls, enamel. Photo: The Al-Sabah collection. 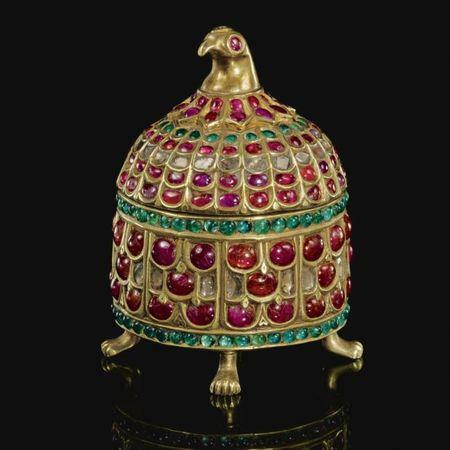 Mughal parrot finger ring (c.1600–1625) with a three-dimensional bird that can rotate and bob (possibly providing hours of entertainment for its owner) is set with rubies, emeralds, diamonds and a single sapphire. Photo: The Al-Sabah collection. 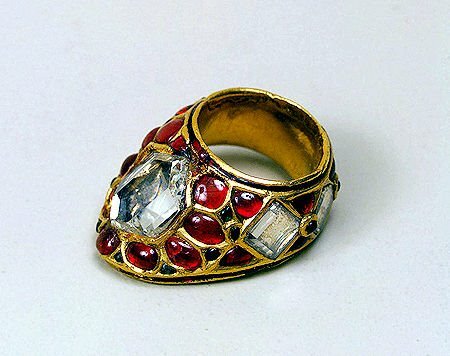 Bird Finger Ring (1st quarter of the 17th century), Indian, Mughal or Deccan - Gold, rubies, emeralds, turquoises; carving, kundan technique. 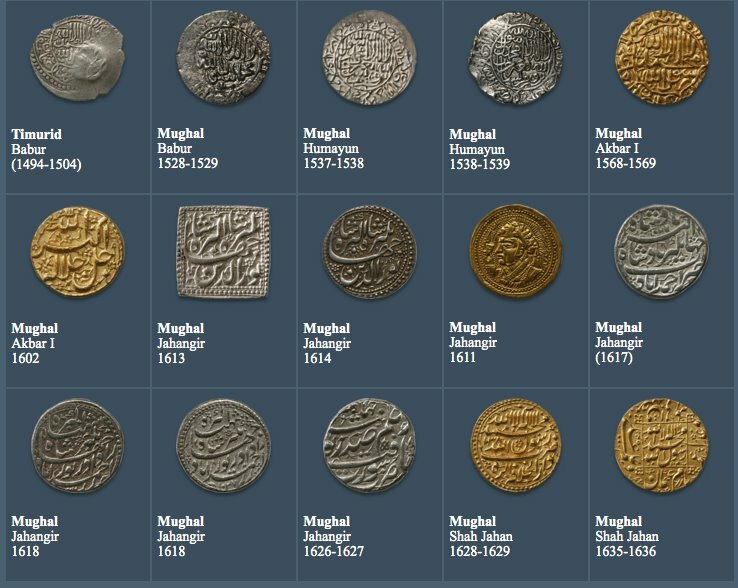 Photo: The Al-Sabah collection. 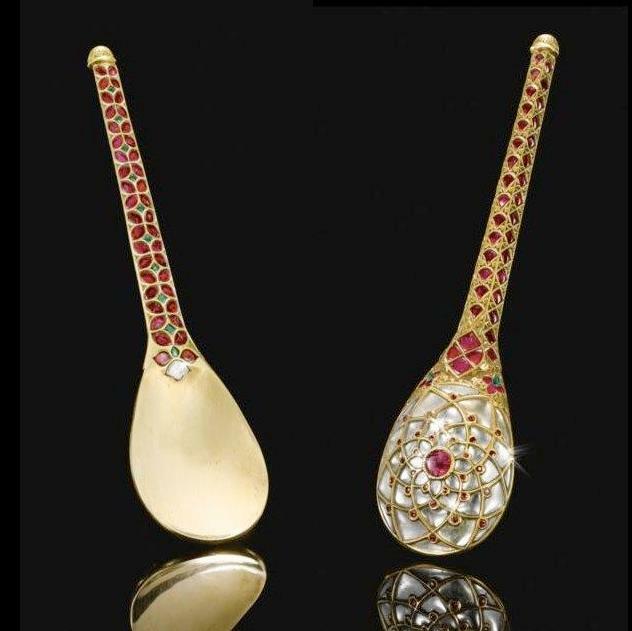 A rare Mughal gem-set gold spoon, India, 17th-18th century. The back is delicately inlaid on the reverse with a lotus rosette comprised of radiating foil-backed diamond petals and rubies, the faceted tapering shaft inlaid with emeralds and bands of ruby quatrefoils within an engraved and chiseled gold framework. Photo: Sotheby's. A Mughal masterpiece. The necklace features five pendant diamonds (Origin: Golconda mines, India) with emerald drops. The central stone weighs 28 cts. and is the largest table-cut diamond known. The five surrounding stones—weighing 96 cts. collectively—comprise the largest known Matching set of table-cut diamonds from the 17th century. It is believed that the jewel once belonged to a Mughal emperor. Northern India; 1st half of 18th century. A Bejeweled Maiden with a Parakeet. Illustrated single work. ca. 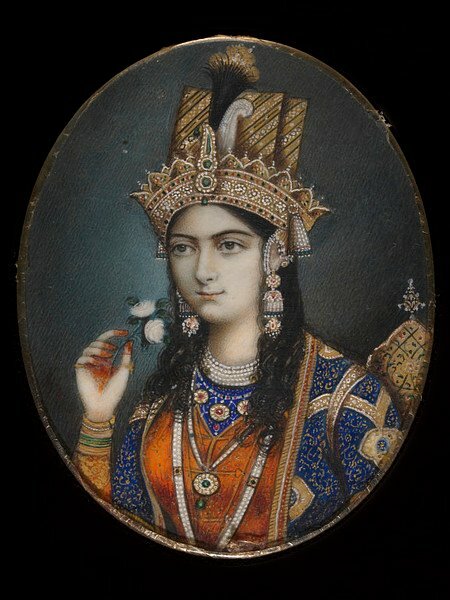 1670–1700, Mughal. India, Golconda, Deccan. The bird sits on the maiden’s henna-reddened fingers, each one of which is separately adorned by a diamond ring. She also wears strands of pearls, with emeralds and rubies. A rare Mughal pale green jadeite snuff bottle. 1800-1900. The flattened, rounded bottle is well carved on either side with a large flower reserved on a dense ground of overlapping leaves. Either shoulder is carved with a smaller flower head as is the top of the mouth rim. The translucent stone is of pale icy green tone. 2 in. (5 cm.) high, pink tourmaline stopper and bone spoon.